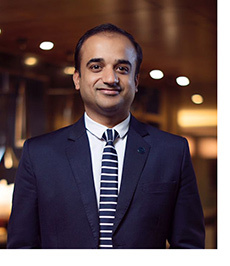 Ather Raza has been appointed as director of operations, Sheraton Grand Chennai Resort and Spa. Bringing with him over 16 years of hospitality experience, he is responsible for ensuring smooth hotel operations and oversee the functioning of various departments. Prior to joining Sheraton Grand Chennai Resort and Spa, he was executive assistant manager (rooms), Sheraton Grand Bengaluru Whitefield Hotel and Convention Centre. Raza joined the Marriott family in 2001 and has a vast experience of handling pre-opening of properties like Sheraton Bangalore at Brigade Gateway, Aloft Bengaluru at Cessna Business Park, Sheraton Grand Bengaluru, and Sheraton Whitefield Hotel and Convention Centre. In the course of his career, he has also been associated with renowned hotels such as JW Marriott Mumbai Juhu and Goa Marriott Resort and Spa. In addition to being a hard-working, goal-oriented professional, Raza loves taking up a challenge. In his spare time, he likes to unwind by playing cricket and listening to music.